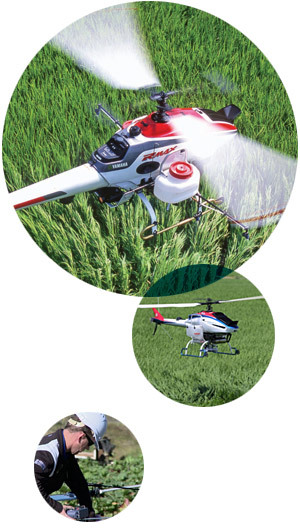 In May 2015, the Federal Aviation Administration (FAA) authorized Yamaha to operate the remotely piloted RMAX helicopter for agricultural‐related uses in the U.S. Specifically, the FAA issued a Grant of Exemption for the RMAX under Section 333 of the FAA Modernization and Reform Act (FMRA). This grant of exemption authorizes the use of RMAX for commercial agricultural operations based on the merit of Yamaha’s petition, which included exhaustive documentation surrounding operational guidelines and restrictions, training requirements and the RMAX track record of safety over 20 years of international operation and over 2 million hours in flight. In December 2015 Yamaha received Part 137 Agricultural Aircraft Operations Certification from the FAA, the first for an unmanned aerial system (UAS). The certification enables Yamaha to begin agricultural spraying in the U.S., subject to approval by state and local authorities in areas where the RMAX remotely piloted helicopters will be used. Within the U.S. agricultural research community, Yamaha has collaborated with University of California, Davis, since 2012 to extensively research, evaluate and validate the application of RMAX for specialized agricultural spraying. The following Frequently Asked Questions are intended to provide clarification on how RMAX will be operated within agricultural settings and Yamaha’s commitment to ensuring RMAX is used safely and responsibly for the protection of all stakeholders in the ag community, especially aerial applicators. What is the FAZER and RMAX? The FAZER and RMAX are gas powered unmanned helicopters designed by Yamaha for commercial agricultural operations. These remotely piloted helicopters can spray liquid chemicals or spread dry chemicals. They are controlled by a remote control transmitter and also have autopilot capabilities. Are there other applications of the UAS other than agricultural spraying? At this time, Yamaha is only authorized to perform commercial agricultural related services per our FAA 333 Exemption. What is the difference between the FAZER and RMAX? The FAZER and RMAX unmanned helicopters are almost identical in size. The most notable difference is that the FAZER is equipped with a more powerful engine which allows for a 50 percent increase in payload. Where else in the United States are these available? Yamaha is currently only offering commercial agricultural services in California. We are working on leasing units throughout the United States to qualified operators and businesses in the near future. Can I purchase a FAZER or RMAX for my own use? Yamaha does not intend to sell the aircraft now, nor in the future. As aircraft regulated under the FAA, these units have a strict maintenance schedule and Yamaha plans to maintain oversight of maintenance and proper use. However, we may offer lease options in the future to growers/businesses that have the proper licenses and qualifications. Can I learn to operate the FAZER or RMAX myself? FAA regulations that govern UAS operations are strict, and only qualified pilots that have Yamaha factory training are authorized to remotely pilot the helicopters. How many Yamaha employees are required for operation? Two employees are required for spray operations - one pilot-in-command (PIC) and one visual observer (VO). The PIC operates the UAS with a remote control transmitter while keeping the UAS within visual line of sight at all times. The VO maintains constant radio communication with the PIC regarding other aircraft, obstacles and spray coverage of the treated area while also maintaining line of sight with the aircraft at all times. How frequently does Yamaha spray? The peak spray season in vineyards can last from April through August. During this time, Yamaha spray teams have a full schedule and normally perform five sprays per week. How long does the spraying process take? This depends on the complexity of the spray site and the desired application volume. For our vineyard applications in Napa, a team can typically cover one- to two-acres-per-hour at complex sites and as much as 3-acres-per-hour at less complex sites (at a 10 gallon-per-acre rate). Can I replace all spraying methods with Yamaha’s aerial system? Yamaha UAS offer solutions to problems faced by growers including terrain that is difficult for ground sprayers, steep hillsides normally sprayed by backpack, and soil compaction, to name a few. Yamaha UAS provide another option for growers and are a great fit for certain applications. What chemicals can be used in the spraying application? Can they spray organic chemicals? Any chemicals, including organic, must be authorized for aerial application to be applied using the UAS. The same regulations that apply to manned airplanes and helicopters apply to the RMAX and FAZER. Will Yamaha bring a unit out to my farm for a test run? This can be determined on a case-by-case basis depending on the spray team’s availability. We enjoy showing our UAS and their capabilities to potential new customers and anyone that has never seen them in action. Costs depend on a variety of factors including acrage, complexity and frequency. If you are interested in our services and would like a quote, please contact UMS_sales@yamaha-motor.com. ©2016 Yamaha Motor Corporation, U.S.A. All rights reserved.